Currently the checklist includes 3 sections: devotion shrines, one-shot chests and important quests, each section shows your progress for every game difficulty. Devotion shrines and one-shot chests have prerendered map previews, clicking on them will open that shrine/one-shot chest on the World Map. When viewing devotion shrines, you can see whether it's a desecrated or a ruined shrine and if it's ruined then the list of offerings needed to restore it. You can click on the items to view them in the Item Database. When viewing one-shot chests, you can see map previews for all spawn locations if chests have more than one possible location. Quests section includes only those quests that grant attribute points and/or skill points. I don't intend to include any others. The tool supports multiple profiles, they are stored in local storage of your browser, you can edit their names, add new ones and delete existing ones. When you visit the tool, it will always load your last used profile. Please note that when you upload character data, by default it will be applied to your current profile, so make sure to switch to the correct profile or create a new one before uploading your characters. Like all other tools it's built automatically from game resources. 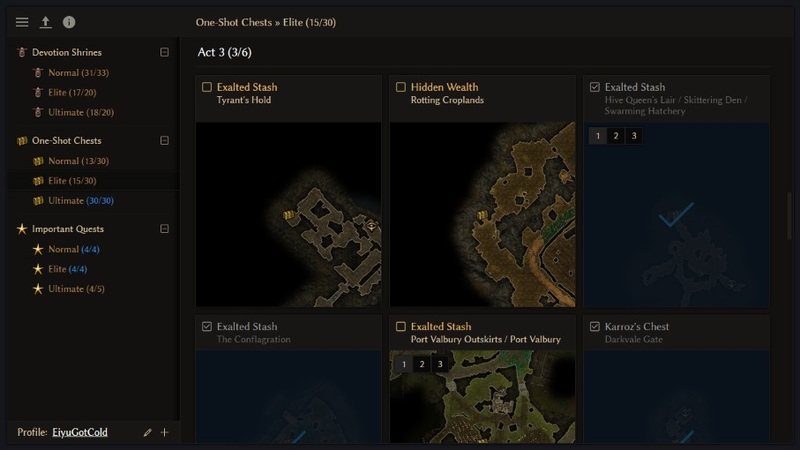 The only hardcoded thing is the area progression order which determines the order of one-shot chests and shrines shown in the tool. This can't be easily detected from map pathing, so I just hardcoded it. Feel free to post any questions, suggestions and bug reports. If you are interested in translating the tool, please refer to this thread. Your work on Grimtools is fantastic, top top top level! Just amazing! What other things could be included that would help give information to the completionists? I thought about adding lore notes, but that will probably require a way to actually read them, maybe somehow link them to the wiki or smth. Another thing that hypothetically can be included is blueprints, but I'm not really sure that anyone would need that, cause there's a ton of them and collecting all of them requires several hundred hours of playtime. Hi Dammitt - The feedback icon (i) in the checklist tool is linked to... interactive map thread on the forum. Check that out. Fantastic tools by Dammit. Thanks! Thanks for reporting this! It's fixed now. I won't add these. Iirc at least 3 inventory bags per difficulty are obtained via main quest, so what's the point in tracking it since you get bags via normal progression anyways? Cool tool, thanks for developing it. I'll put my 2 cents in for blueprints as I'm currently at the point where I know I have a few I'm missing but it would be nice to know exactly which ones without going through the list of 326 manually and checking blacksmith.